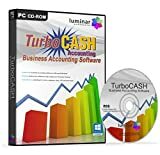 TurboCASH Accounting offers you and your business a collection of the best accounting software tools available. With many advanced features this product offers much more than simple home finance management or small business bookkeeping. It supports every accounting function that you will ever need for your business including debtors, creditors, general ledger, full stock control, VAT accounting, invoicing, bank reconciliation, trial balance, balance sheet and income statements, full reporting, multi-company and multi-user capabilities and much more. This entry was posted in Software and tagged Accounting, Business, Software, TurboCASH by Computer Education World. Bookmark the permalink.